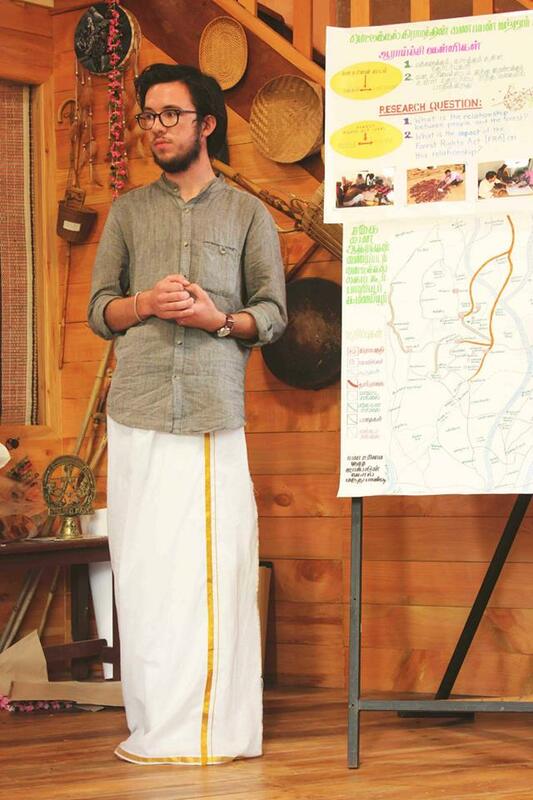 After participating in AYLP with Bangladesh during his senior year of high school (2012-2013), Cole moved on to Cornell University, where he is majoring in Urban and Regional Studies. In his free time, Cole works as a leader of the campaign encouraging Cornell to divest from fossil fuel energy sources and serves as an officer on the Alumni Advisory Board. He spent last semester studying abroad in India. It’s 5am and punchy Tamil music is blaring loudly in my ear. Usually the radio stays on all night, but not at this volume. I wrench myself upright off the plastic mat that is my bed, and squint at the figure in the sunlit, earthen doorway. It’s Parvathi, and in her hand she is extending a steel cup of greenish coffee toward me. I accept it, as always, and survey the rest of the room. Most of the men I share the mud sleeping-hut with are awake, though my partner Maruthupandi is still tightly wrapped in his coarse woolen blanket. Parvathi squats just inside the threshold, sipping on her own coffee and snapping at the puppies that keep daring to intrude. And so begins another day in Mettukkal, the tribal village in southern India where I lived and did fieldwork during my semester as a student at the Nilgiris Field Learning Center (NFLC). The NFLC is a new educational and research collaboration between Cornell University and Keystone Foundation, an eco-development NGO based in the Nilgiris Biosphere Reserve of Tamil Nadu in southern India. ‘Biosphere reserves’ are designated by the United Nations as parts of the world that possess exceptional plant and animal biodiversity. In the case of the Nilgiris, that biodiversity is paired with a robust legacy of indigenous cultural diversity as well. Before engaging in this program, I did not understand that in certain parts of India there are distinct tribal adivasi communities that function outside of the caste system and often at odds with the industrial, economic, and political forces around them. Their villages, sometimes situated deep in the forested hills, face severely limited access to basic services—while the accelerating loss of traditional knowledge (such as specially adapted agricultural and medicinal practices) makes the need for those services even more urgent. Though the issues faced by these communities are certainly very specific to their location and identity, many of them illustrate a broader global conflict between polarized worldviews. Having previously traveled to Bangladesh with the 2012-2013 AYLP cohort, my expectations for participating in the NFLC were mixed. I had a general grasp of what being an American in south Asia was like, but had no clue where to start on a research project that would span multiple cultures, languages, educations, and lived experiences. Toward the beginning, this uncertainty caused me a lot of anxiety. How could we be expected to collect and analyze data thoroughly under these circumstances, when both the Cornell students and our Indian peers stood on opposite sides of a severe language barrier? I felt totally unprepared to do anything that would be considered ‘productive’ back at school, but as the semester progressed I began realizing that the goal of our projects wasn’t necessarily to produce anything in the conventional sense. As citizens of what is called the ‘developed’ world, we are often implicitly told that it is our responsibility to help improve the ‘developing’ places we visit. Thus, there exists a culture of volun-tourism that many of us have encountered. But after living in Mettukkal for a month, it became clear to me how much effort and understanding it takes to effect real change, even in a very small community. When I first arrived, I saw problems that (to me) had simple solutions. But with time I grew to recognize and appreciate the complexity of the issues I was observing, to better understand the culture they were embedded in, and eventually concluded that it was naive of me to think I could (or should) change anything of consequence in the course of one semester. Once I was able to shift my mindset about the purpose of my time in India, the work I was doing took on new meaning. Instead of focusing on the results of our research project, I began to pay more attention to the process. By striving to be intentional and inclusive with our communication, we as a team were able to build and maintain meaningful, mutually beneficial relationships across the language and culture divide. The data we collected was obviously still important, but the skills that came with that journey are ultimately what we can use to create change in our own communities. For anyone considering studying abroad, I would definitely encourage you to do so. Challenging yourself to navigate a totally different environment can only be a learning experience. I think there is a certain social pressure to “make a difference” or have a life-changing experience when doing so, but this attitude seems to trivialize the difficult reality of actually living in a foreign place. I did not leave India as a different person, with a collection of heartwarming anecdotes ready to dole out when asked. Though I’m still processing a lot from my experience, I can definitely say that being immersed in a foreign setting for so long has, more than anything, allowed me to understand my own home in a whole new way. Sometimes, you have to travel far in order to truly know where you come from, and it is this insight—along with the unforgettable bonds I was lucky enough to forge with my Indian peers and advisors—that I will take with me into the future.